Finally. Only a few months ago, we wondered what happened to the genetics of Febrile Seizures, given that there was a paucity of publications in this field. Now, a recent publication in Nature Genetics presents the first well-powered genome-wide association study in Febrile Seizures in almost 2,000 patients, including a large subgroup of patients with Febrile Seizures after MMR vaccinations. The authors provide compelling evidence for common variants in known epilepsy genes. However, the strongest genetic risk for Febrile Seizures is in a known disease gene that nobody expected. Out of nowhere. I had to look twice when this publication popped up in my NCBI alerts. A genome-wide association study in Febrile Seizures on more than 2,000 patients and 4,000 controls? Including an additional validation cohort? Vaccination-related Febrile Seizures thrown in as an additional feature? Ion channel genes that actually fit our current understanding? The study by Feenstra and collaborators is more than I could ever ask for and virtually opens up a completely new chapter in epilepsy genetics. Vaccination and no vaccination. The study by Feenstra and collaborators basically investigates two types of Febrile Seizures. The author’s study has a strong focus on vaccination-related seizures, specifically febrile seizures in response to the measles, mumps and rubella (MMR) vaccinations. These events are rare and have a benign outcome, but the risk for Febrile Seizures in the setting of MMR vaccinations is almost tripled on a population level, adding to roughly 10 additional cases of Febrile Seizures per 10,000 vaccinated children. Their study included almost 1000 patients with these MMR-related seizures and 1000 individuals with Febrile Seizures (FS) unrelated to vaccinations. For the overall analysis, they had access to a large control cohort and a validation cohort of additional patients with FS related and unrelated to MMR vaccinations. The authors performed four parallel, stringent analyses. What did they find? The study by Feenstra and collaborators. 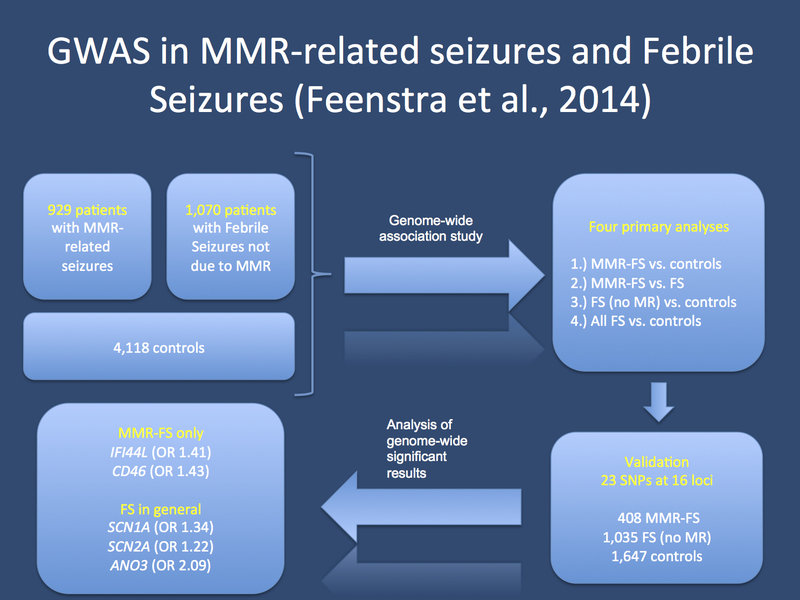 The authors investigate patients with Febrile Seizures in the setting of MMR vaccination (MMR-FS) and Febrile Seizures without prior vaccination. Their study has a discovery and validation cohort. The genes that survived the strict correction for genome-wide significance included IFI44L, CD56, SCN2A, SCN1A and ANO3. SCN1A, SCN2A. The analysis of Febrile Seizure in general finds associated loci next to the SCN1A and SCN2A genes. Both genes code for well-known epilepsy genes. While common variants in SCN1A were implicated in at least two other genome-wide association studies in epilepsy, this is the first time that common SCN2A variants are implicated. This fits nicely into the channelopathy concept of the seizure disorders, suggesting that genetic variants in ion channel genes are contributors to various epilepsies. The rs7587026 variant close to SCN1A is the common denominator between the current study, a previous study on TLE and Febrile Seizures, and the recent ILAE GWAS meta-analysis. Only a year ago, I would not have believed that such a convergence of evidence in epilepsy genetics may be possible. Vaccination-related. There were two loci that were exclusively associated with MMR vaccination related seizures. Common genetic variants close to IFI44L and CD56 were only found in the analyses that examined vaccination-related Febrile Seizures. Both genes are interesting in that the encoded proteins are involved in the response of the immune system to viral infections. While further studies will be required to see how these genetic variants interact with the immune response to result in Febrile Seizures, there is one important message stemming from this analysis: different Febrile Seizure subtypes may have a genetic underpinning, which includes both shared and distinct genetic factors. Vaccination-related seizures are not only Febrile Seizures brought out by vaccinations, but have their additional distinct genetic risk factors. But there is one gene that has yet a stronger effect than any of other risk factors. ANO3 variants. While the risk conferred by variants in SCN1A and SCN2A fit the overall framework of our current understanding of epilepsy genetics, the locus with the strongest association was in the ANO3 gene. ANO3 or TMEM16C codes for anoctamin 3, a transmembrane protein of unknown function that belongs to a family of chloride channels. Interestingly, dominant ANO3 mutations are known to cause craniocervical dystonia, a genetic movement disorder mainly affecting the head and the neck. Dystonia and Febrile Seizures have very little in common other than both representing disorders of the Central Nervous System with a genetic cause. If and how both conditions are related and how variants in ANO3 confer risk to both conditions is clearly a task for future research and currently beyond our understanding. Statistical considerations. The variants close to IFI44L, CD56, SCN2A and SCN1A have a relatively high odds ratio with 1.4 or higher. The locus close to ANO3 has an deven higher odds ratio of ~2. These risk ratios are higher than the risk conferred by common variants in other epilepsies including IGE/GGE or TLE. This observation is reminiscent of the genetic studies for common diseases in general that usually show a higher contribution of common variants compared to neurological disorders. This fact may suggest that the genetic architecture of Febrile Seizures may in fact resemble the architecture of common diseases rather than following the pattern of rare diseases, where de novo mutations are increasingly implicated. In summary, the strong effect of common variants in FS is unexpected and surprising. These findings suggest that larger GWAS in FS may be able to capture a significant proportion of the genetic risk to FS through common genetic variants. This is what you need to know. The current study by Feenstra and collaborators is the most important progress in the genetics of Febrile Seizures of the last decade. The authors implicate common variants close to SCN1A and SCN2A as FS risk factors, identify ANO3 as a new risk gene, and identify two loci that specifically predispose to FS in the setting of MMR vaccination. With increasing sample sizes, we might be able to make further, important progress in this field, identifying the genetic contribution of the most common epilepsy syndrome in children. This entry was posted in 2014, ILAE Genetics Commission, Publications and tagged ANO3, CD56, common variant hypothesis, febrile convulsions, Febrile Seizure, GABRA1, GWAS, HCN1, IFI44l, infection-induced seizures, measles, mumps, rubella, SCN1A, SCN2A, teething seizures, vaccination, vaccine encephalopathy, viral infection. Bookmark the permalink.